We recently had good discussions on Twitter and in the blogosphere, with knowledgable people, regarding Guinness stout. We discussed the last days before it became what is technically called a keg beer, meaning a chilled, carbonated, and pasteurized draft. These processes are part of modern beer technology, and meant to ensure consistency and stability. Guinness’ draft and bottled beers were really in many ways two separate products, although their history is similar regarding having a “real”, and then a modern, more processed stage. This post will talk about the draft beer, and later I’ll address bottled Guinness. It will interest many to know that Guinness was once a “real ale”, or cask beer in modern parlance. This is a beer that is not artificially carbonated or filtered and is dispensed from the barrel with no added pressure. It has a limited shelf life. Cask beers are either served slightly turbid with their natural yeast and proteins, or haze is removed by finings at some point in production or sale. Finings is an agent made from different natural products which clarifies the beer. Even where finings is used, cask beer has a “live”, natural taste which a filtered and gas-charged beer doesn’t have. Until the 1960s in Ireland, draught Guinness was a real ale. 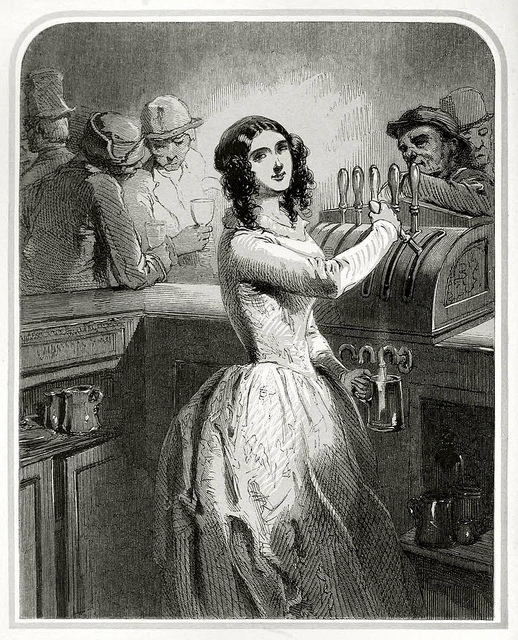 It was served either by hand pump, or a compressed air system, or straight from the barrel placed on the bar. In some cases, at least earlier in the history, two casks were used. One contained older, flatter beer, and the other newer, more lively beer. The barman poured from the one cask about two-thirds the way, let it rest, and finished the pour with the other. This achieved a balance of fresh and matured notes, the right degree of bubble, and a creamy head. These casks were called “low” and “high” casks, either because that was their position behind the bar – one was atop the back bar, the other below it – or because one had “high” (lively) condition and the other a flatter, lower condition. These age-old methods harked back finally to Georgian London, where stout and porter find their roots. The problem was that the beer was often inconsistent. Some people got a pint that was too flat, too sour, or too yeasty and fresh. Guinness, a legend in international brewing and a large concern by the 1950s, determined to modernize its business and increase profits further. Thus, in 1958 Guinness technical staff perfected a method of serving the beer using a mix of carbon dioxide and nitrogen. Beer bloggers and writers Boak and Bailey have explained recently that this followed a long history of technical innovation and experimentation by Guinness. The new version of Guinness was filtered of its yeast to preclude further biological activity in the barrel, was somewhat cooled, and surged from a special tap assisted by the nitrogen gas, which also lent a creamy note to the beer. Barmen were instructed to do a two-stage pour, familiar to many today who know Guinness. This was apparently intended to replicate the old double pour from the high and low casks. The new system was introduced in stages in the 1960s in Ireland. It appears an earlier “kegged” version of Guinness was supplied to markets in England, at least since WW II. People still argue whether the modern double pour really does anything for the beer or was an inspired marketing blarney. 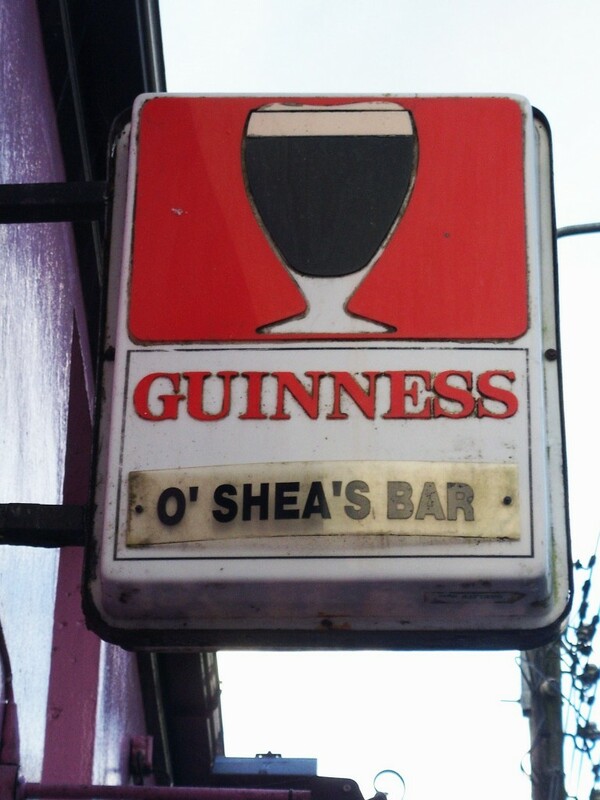 Originally in Ireland, the new form of Guinness was not pasteurized. Heat-treating the beer to render it stable was not thought necessary due to its brisk sales in the Republic and Northern Ireland. Today however, all forms of Guinness are pasteurized in Ireland, and of course everywhere else. The lack of pasteurization and high turnover of Guinness between the 60s and 90s in Ireland may explain its special reputation there versus when consumed in Boston or Paris, say. While most Guinness in England and Ulster, speaking again of the draft, was the modern keg type as early as 1945, some “real ale” Guinness may have been available in London and Belfast, possibly as late as the early 70s. Beer obsessives still talk about these details. Why? Because the palate of the drink had to be different when it still contained residual yeast and proteins and wasn’t charged with gases mechanically. And quite naturally, people wonder how that pre-“nitro” Guinness tasted. At its best it was surely very good, the famous “black wine” of Eire. It apparently had a complex, somewhat sour (winy) palate with dashes of sweet and sour. How did the keg version change the taste? When very fresh the drink is still good, roasty and on the dry side, but not a great beer in our opinion. Any well-made cask stout or porter from a craft brewer usually exceeds it. Yet, the post-1960 form is certainly consistent, whereas the former was not, by all evidence we are aware of. Surely a price was paid to be able to drink the beer in reliably good condition in Ireland or almost anywhere in the world, versus the artisan, sometimes unpredictable product it once was. Finally, we should note that since the 1970s at least, Guinness uses a fair amount of unmalted barley in the beer. Originally and until some point in the 1900s it was all-barley malt. All-malt beer tends to have a richer, fuller taste than one using some non-malted grain, if not attenuated (fermented) to within an inch of its life at any rate. What would Guinness be like if made to an all-malt, 1800s recipe, and served in “cask” form? Probably superlative. I always wonder why the Guinness brewery doesn’t make some beer available in this form. It would be a salute to history, and please many connoisseurs of the black stuff. Guinness has recently set up a small experimental brewery in Dublin where different styles of brews have been made, a Belgian tripel for example. But so far no “original” version of Guinness stout or porter has issued, to my knowledge, nor a cask version of its current brew. One hopes this will change and a true, 19th century-style porter and stout will once again issue from the famous St. James’s Gate brewery. Meanwhile, it would be interesting to obtain the reminiscences of people in Dublin who remember the beer before it went nitro. Note: the images above are in the public domain to my knowledge, all feedback welcome. Quebec Spruce Beer (Biere d’Epinette). Great article. When I drank Guinness in Ireland in the 80s and 90s the nitro was far from consistent but this made things fun. There were wild differences between some pubs and word of a great pint poured made many of them mythical. You also quickly heard of the ones to avoid. Sadly, with technology, Diageo have now made Guinness average everywhere. When I visit Dublin these days I drink stout in the Porterhouse. Brewed by them and unpasteurised they’re the best stouts I’ve tasted in Dublin in a very long time. I have since updated this post with this post on March 17, 2018. Clearly Guinness has made some efforts since the time I wrote the text above, including making Foreign Extra Stout and the Antwerpen (or Special Export) Stout available on draft at its new tasting bar in Relay, MD. Previously these beers simply bottled. There was even a very limited issue of a bottled Guinness Imperial Stout, see my comment to that post. But these beers, except perhaps the imperial stout, are not naturally-conditioned. As well, all Guinness stout I believe uses a substantial amount of unmalted barley, except perhaps the imperial stout again, which is barley malt plus some roasted barley (for the colour). There have been new beers in recent years as well such as West Indies Porter, Dublin Porter, and 200th Anniversary Stout although these aren’t diverged much from the basic palate of Guinness Extra Stout, the non-widget, bottled form that has long been available. Guinness still has a long way to go to reviving the best of its heritage. Producing in Dublin, and now the U.S., very small amounts of currently fashionable styles such as Belgian and flavoured beers at the Open Gate pilot breweries is rather a diversion from this goal, in our view.